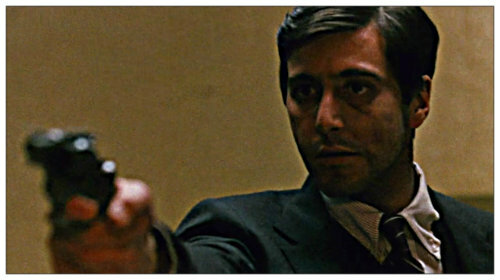 I saw The Godfather at a theater in 1972. With my parents. Under protest. They had shopped for furniture all day, dragging me along like a fidgety hostage (I was 11). Then they said we were going to something called The Godfather. Mom tried to sell it as an exciting gangster movie. But rhe gangster movies I knew from TV were boring black-and-whites with funny-looking actors talking out of the corner of their mouth. So I went in tired, cranky, and darkly pessimistic. I probably didn’t move for 3-hours as Woltz woke up with poor Khartoum, Luca went to sleep with the fishes, Michael ate out with Sollozzo and McCluskey, Sonny paid his last toll on the causeway, and Tattaglia, Barzini, Cuneo, Stracchi and Moe Green had their terrible day. I have since watched The Godfather so many times it replays in my mind like VR. I could pick Sollozzo’s driver out of a police lineup. By name. And I can do a dead-on impression of Fredo’s nervous breakdown in the alley.